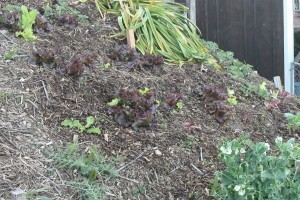 I started a lettuce mix in a pot in March 2011, and then transplanted many of the seedlings when they were 3-4″ tall to the hillside. One type of lettuce really took off and grew like gangbusters throughout the spring, while the other ones (mostly the green ones) did very poorly. I think the variety that did well is “Red Sails” from Nichols Garden Nursery. The heads grew really well through June. So I let some of the best heads go to seed to keep them for next year. The cool foggy summer evenings made the lettuce flowers get all moldy, though! I’m not expecting that this seed harvest will be good, but we’ll see soon enough.